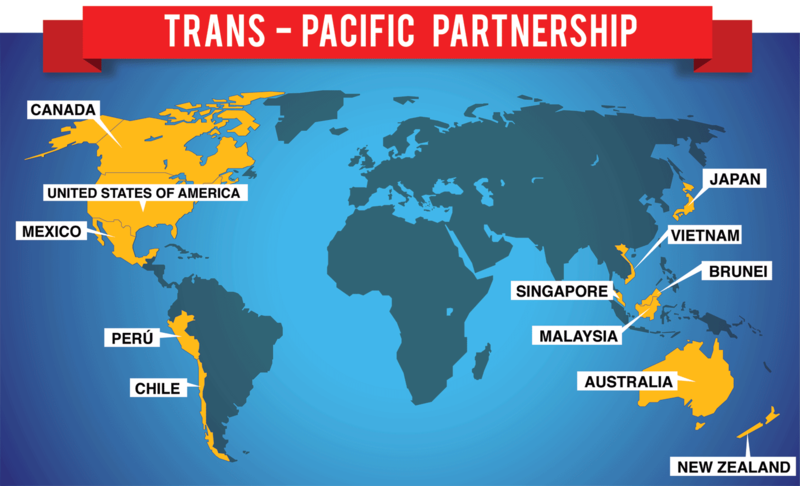 As the largest and most ambitious trade agreement signed to date, The Trans-Pacific Partnership (TPP) has twelve diverse members: the USA, Japan, New Zealand, Australia, Brunei, Canada, Chile, Malaysia, Mexico, Peru, Singapore, and Vietnam. After seven years of negotiation, this agreement was signed on the 4th of February 2016 in Auckland, New Zealand, but has still not entered into effect. The agreement has thirty chapters concerning matters of public policy, with goals that include promoting economic growth by creating jobs and innovation, increasing standard of living, and reducing poverty, as well as environmental protection, workers’ rights and regulatory coherence. Aside from those policies, the agreement contains measures to lower trade barriers such as tariffs and to establish an investor-state dispute settlement mechanism. Once ratified, the 12-nation would-be bloc is already responsible for 40% of world trade and eliminates nearly 20,000 tariffs on various goods. As the 12 countries have a collective population of about 800 million, the deal was seen as a remarkable achievement given the very different approaches and standards within the member countries and that’s why the prospect of the US pulling out is being seen as such a blow for those who signed up. All the promising outcomes predicted for the TPP agreement, and the Obama Administration’s support of it, were not similarly reflected in the upcoming administration. The US President-elect, Mr. Donald Trump, asked about the fairness and the purpose of this trade agreement compared to other existing trade deals. He further referred to the partnership as a potential disaster for the USA. His election win signals the death of the TPP. Last week, he issued a notification of intent to withdraw from the TPP, especially if certain demands are not met according to his described policy roadmap. His arguments against the TPP are the same as his argument against NAFTA. One of Trump’s major critiques is that such agreements are responsible for the flight of US manufacturing jobs. He brought the Chamber of Commerce prediction stating that continuing the TPP, as well as NAFTA agreement, could lead to massive job losses and rising prices in the USA. No trade deal is perfect, including the TPP. However, some positive observations have been made by experts in answering all the negative criticisms from the President-elect. Firstly, the high output of America’s total manufacturing should boost the confidence of the average American worker. The government’s successes in supporting the industry through cheap energy, investment in skill development, and friendly labor-management relations have created nearly 900,000 manufacturing jobs since 2010. Judging from the amount of jobs available, Trump should not worry too much that this trade deal will harm or destroy the country. Second, it might be true that the TPP could harm other poor countries, but specifically, it will harm those who are not members of the agreement. Those companies in non-member countries might sell products at higher prices due to increased tariffs, thus it will be less competitive compared to those companies selling products at lower prices. On the other hand, those companies located in member countries will enjoy free tariffs when trading their goods, thus will be more competitive and will price their products lower. Moreover, blue collar workers in TPP member countries would have freedom in forming independent trade unions, electing their own labor leaders, collectively bargaining, and eliminating all child- and forced-labor practices. Most importantly, the TPP covers regulations related to minimum wages, hours of work and occupational safety and health. Thirdly, this agreement has some other focuses not mentioned in any other existing trade agreements. Some focuses, which are available only in TPP: 1) a negative-list approach to liberalizing trade in services, which covers all sectors except those explicitly listed (as opposed to the positive list of sectors under GATS); 2) new internet and digital commerce regulations; 3) across-the-board national treatment for foreign investors, both prior and post establishments; 4) standardized principles streamlined rules; 5) enhanced intellectual property protection; 6) government procurement commitments; 7) state-owned enterprises; 8) codes for labor and environment; and 9) improved dispute resolution for many issues covered in the agreement. US withdrawal from this agreement is indeed disappointing and has left some Member countries with a sour taste in their mouth. Prime Minister Abe from Japan mentioned that this agreement is meaningless without the US participation. However, let’s answer the one-million-dollar question: what would really be the US disadvantage for quitting the TPP? By backing out of the agreement, the US would break some bonds of cooperation with the Asian countries. In addition, as Asia’s ever-growing economic weight is something that has been discussed extensively, establishing rules and institutions that will meet the world’s needs of the 21st century is critical for the USA. TPP is the only path to influencing the development of those rules and institutions as the existing institutions and rules are simply not adequate to meet the evolving needs of Asia’s dynamic economies. The TPP itself is the core of the USA’s connection to Asia and might be the only chance for the USA to be part of establishing a trade agreement in the Asian region. It must also be taken into account that the USA’s reluctance to embrace the TPP would not stop free trade in the Asian region – it will still move ahead.